Chromogenix Coatest® Heparin is a chromogenic assay kit for the in vtiro diagnostic photometric determination of heparin in human plasma. 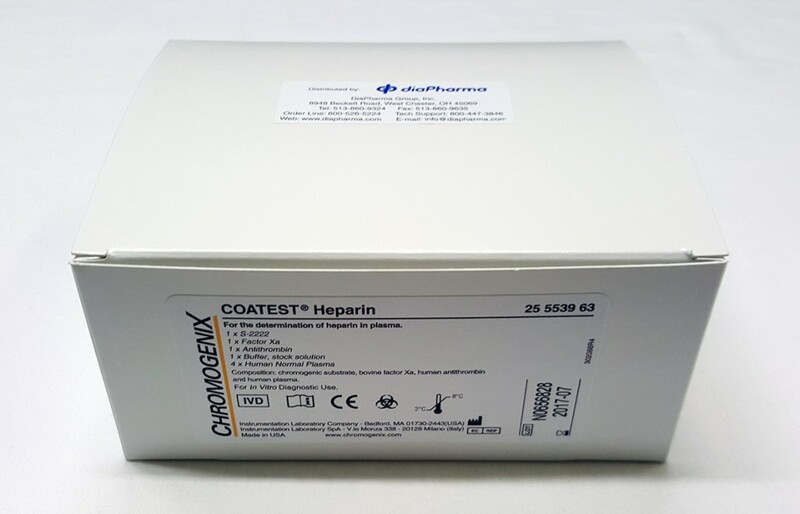 The Coatest® Heparin test kit determines the anti-FXa activity of LMW heparin and UF heparin. Excellent reagent stability. Suitable for both large and small laboratories. S-2222™, 1 vial. Chromogenic substrate (Bz-IIe-Glu-(g-OR)-Gly-Arg-pNA·HCl) 15 mg with mannitol added as a bulking agent. Reconstitute with 20 mL sterile water to obtain a concentration of 1 mmol/l. The solution is stable for 6 months at 2-8°C. Factor Xa, 1 vial. Bovine Factor Xa 71 nkat. Reconstitute with 10 mL sterile water. The reconstituted Factor Xa is stable for 1 month at 2-8°C or 6 months at -20°C or below. Buffer, stock solution, 1 vial. Tris 0.5 mol/l, pH 8.4, 10 ml. An opened vial of stock solution is stable for 2 months at 2-8°C. Before use dilute accordingly: 1 volume of stock solution with 9 volumes of sterile water. Antithrombin, 1 vial. Lyophilized human Antithrombin, 10 IU. Reconstitute with 10 mL sterile water to obtain a concentration of 1 IU/ml. The reconstituted Antithrombin is stable for 1 month at 2-8°C or 6 months at -20°C or below. Normal Plasma (human), 4 vials. Lyophilizied plasma. Reconstitute with 1.00 mL sterile water. The reconstituted plasma is stable for two weeks at 2-8°C or 1 month at -20°C or below. When kept at 2-8°C the sealed reagents are stable until expiry date printed on the label. Avoid contamination by microorganisms in opened vials. Heparin is analysed as a complex with antithrombin (AT) present in the sample. The concentration of this complex is dependent on the availability of AT. In order to obtain a more constant concentration of AT, purified AT is added to the test plasma. FXa (in excess) is neutralized in proportion to the amount of heparin, which determines the amount of [Heparin • AT] complex.The remaining amount of FXa hydrolyses the chromogenic substrate S-2222™ thus liberating the chromophoric group, pNA. The color is then read photometrically at 405 nm. Heparin preparations extracted from animals have been used clinically for over half a century as a potent anticoagulant therapeutic for the treatment and prevention of thrombotic disease. Bleeding and heparin-induced thrombocytopenia are the main adverse reactions associated with heparin therapy. These risks can be minimized by appropriate patient management and by laboratory monitoring using specific chromogenic anti-factor Xa assays. The clinical indications for these assays are reviewed together with a basic introduction of the clinical pharmacology of heparin. Heparin is a naturally occurring, highly sulfated polysaccharide, characterized by a wide molecular weight range and powerful anticoagulant properties. Since its discovery by McLean in 1916, heparin has become a widely used anticoagulant for the treatment and prevention of thrombotic diseases and for maintaining blood fluidity in extracorporeal devices. Material for clinical use is derived from porcine and bovine tissue and is prepared either as unfractionated (UF) heparin or as depolymerized low molecular weight (LMW) heparin. The main complication with heparin therapy is that it occasionally causes life-threatening bleeding. Laboratory monitoring with adjustments of doseregimens is one of the options available which may improve the antithrombotic efficacy of heparin and reduce the risk of hemorrhage. However, the ideal heparin test and its clinical relevance is still a controversial topic.